Our printable fabric is a three layered woven fabric that is 100% Polyester. This fabric is wrinkle resistant with minimal light reflection. The minimal space between threads on this fabric allows for exceptional print quality and opacity, more than other standard fabrics. Fabric is suitable for table tops, photo backdrops, and elegant pop displays. 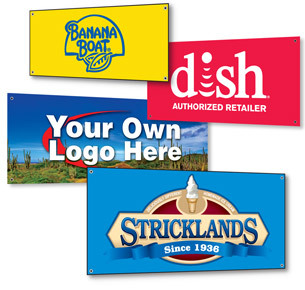 Fabric Banners are a cost-effective, durable and versatile solution for promoting sales, grand openings and open houses, and provides a sophisticated appearance with the addition of indoor graphics and color. Banners and backdrops printed on fabric add a level of elegance and sophistication beyond the vinyl banner, yet are still affordable. The standard cloth fabric material is typically used for full-color trade show backdrops and is lightweight, wrinkle-resistant and even washable! 3 to 5 business days turnaround for production. Maximum Size: 56"High X 300' Wide as one piece. However, we can sew fabric banners together for a bigger size banner.